We have learned that the angle sum of a triangle is . We have also learned that the angle sum of a quadrilateral is . In getting the angle sum of quadrilaterals, we divided the quadrilateral into two triangles by drawing a diagonal. 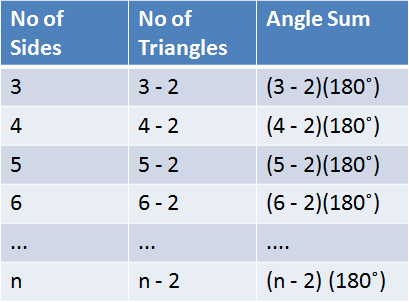 In this post, we use this method to find the angle sum of the pentagon and other polygons. 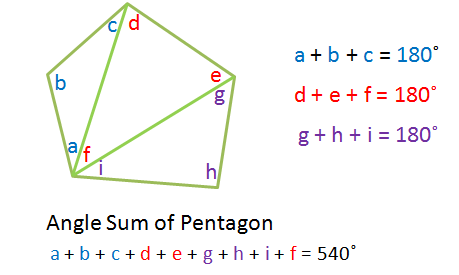 Let us extend the method stated above to pentagon (5-sided polygon). Clearly, we can divide the pentagon into three non-overlapping triangles by drawing two diagonals. Since each triangle has an angle sum of , the angle sum of a pentagon, which is composed of three triangles, is . Using the method above, we can see the pattern on the table below. The sum of a polygon with sides is degrees. Next, we summarize the polygon angle sum theorem and prove it. The angle sum of a polygon with sides is 180(n-2) degrees. A polygon with sides can be divided into triangles. Since the angle sum of a triangle is , the angle sum of a polygon is . In the proof above, we have only considered the angle sum of a convex polygons. Does this theorem also hold on non-convex polygons? Explain your answer.